Peaches Boutique is located in a strip mall with many other stores. Unfortunately parking is very limited. Parking in any of the 15 minute parking spots, the laundromat across the street, Walgreens, or the Payless Shoe Source parking lot across the street is NOT recommended as cars can be towed. 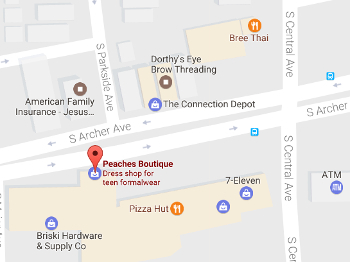 There is additional Peaches Parking across the street at 5928 S. Archer Ave. as well as the Shop and Save parking lot. south/west corner parking lot of Central and Archer Ave.
Take Central Ave South to Archer Ave.
corner parking lot of Central and Archer Ave.